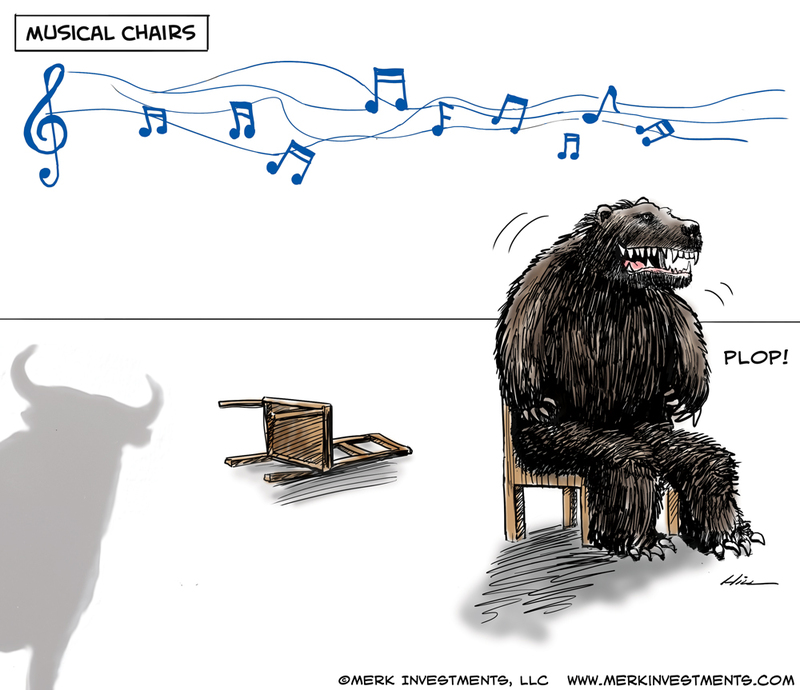 Merk Insights - What's next for the dollar, gold, stocks and bonds? In assessing our crystal ball for 2019, the starting point is the Federal Reserve (Fed) because they provide an anchor for the price of risk-free assets (Treasuries) around which risk assets are priced.1 When rates were near zero and the Fed purchased Treasuries, it wasn’t only Treasury yields that were depressed, but the Fed pulled down yields of risk assets as well. Differently said, the Fed made it appear as if risky assets were less risky; this didn’t only affect bonds, but also equities that enjoyed years of rising prices on the backdrop of low volatility. This was the era of compressed risk premia. Part of the rise in risk premia in 2018 was a direct result of rates moving higher; that said, volatility has come back with a vengeance. Historically, in our analysis, an extended period of low volatility (remember the goldilocks-years ahead of the financial crisis?) is often followed by an extraordinary surge in volatility. As such, to an extent, the elevated volatility we see now is to be expected. Possibly it is also related to algorithms dominating some markets; and/or geo-political events. But could it be that the Fed’s transition from FOMC to FOFC has something to do with it? The Federal Reserve Open Market Committee (FOMC) is the body that, under the leadership of its Chair Jay Powell, sets the Federal Funds Rate. The FOFC, in contrast, is the Flip Or Flop Committee. The FOFC appears to be a secret body, as I have yet to see any announcement that it has formally been established. Yet, judging from Fed Chair Jay Powell’s comments in recent weeks, it may have displaced the FOMC. Joking aside, the Fed had been on a set course to let its large Treasury holdings run off (engage in so-called quantitative tightening or “QT”) and to raise rates. Until last summer, Powell had made it clear that even with the higher rates, the Fed was still “accommodative”; in December, after the 4th 0.25% rate hike of 2018, the FOMC statement stated that the interest rates had now reached what some at the Fed considered to be neutral, implying rates would need to move higher – especially since he had indicated a few months earlier that rates may need to move above neutral. He had also suggested not to touch the QT program, so as to not to confuse the markets with multiple policy tools. Fast forward and it’s a different story: in a recent panel discussion, Powell implied the path of quantitative tightening is not set in stone, and the Fed would be flexible. Similarly, Powell suggested the Fed can be very flexible, even lower rates on short notice should it be required. What??? The key thing that had changed is that some markets have thrown a tantrum, notably the equity markets. Also, while the Fed talked about raising rates, the markets wanted to hear none of that, pricing in ever fewer rate hikes for 2019 as 2018 was winding down; after Powell’s comments about being willing to reverse course, the markets even priced in a decline in interest rates for later this year. The tantrum didn’t start in a vacuum. Earlier last year, some emerging market currencies fell sharply versus the dollar. Such stress is not uncommon as many businesses in emerging markets get their funding in U.S. dollar where the cost of borrowing is lower during ‘good times’; however, during ‘bad times’, local currencies suffer, causing strain on those borrowers to service their debt. As the year progressed, there were signs of slowdowns in some international markets. 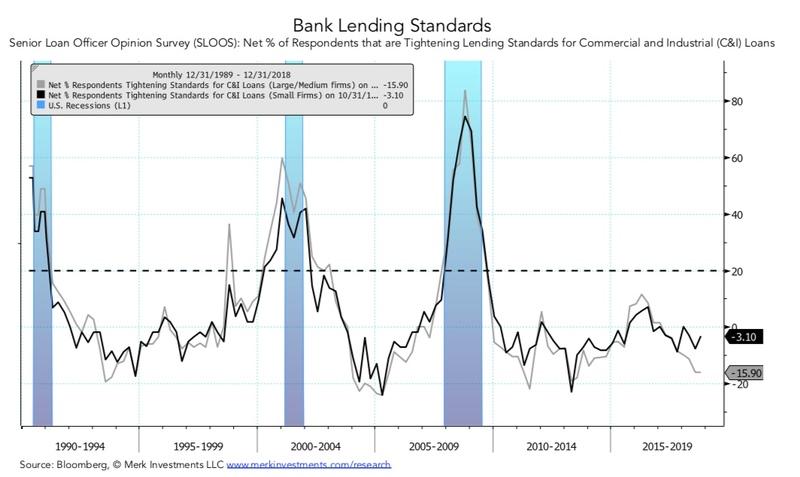 And based on the SLOOS, sure, the wheels may be falling off somewhere in the world, but in the U.S., lending standards have not substantially tightened. Basically, the rearward looking Fed can see that financial conditions are gradually tightening, but had not reached all areas where it matters. In the meantime, the forward-looking markets were suggesting – at least according to common media interpretation - that the slowdown is coming in earnest. I’ve pointed out that Powell is an attorney, not a Ph.D. economist. With that I’m suggesting he does not have an academic agenda that I allege Bernanke (the student of the Great Depression) and Yellen (the labor economist) had. Instead, I assess him as the type of person who will call a committee to make a decision, suggesting he will be re-active rather than pro-active. Greenspan was known for going out on a limb, making pro-active decisions based on his projections. Powell is a different type of Fed Chair. Separately, while the public has been told QT is on a steady path, this hides the underlying unease at the Fed where as to where QT should lead. In my assessment of discussions at the Fed, there is a general consensus that the Fed’s balance sheet should be shrunk (letting Treasuries run off “shrinks” the Fed’s balance sheet), but there was never consensus as to its exact size, other than it should be larger than the pre-crisis level, amongst others - but not only - because there’s more cash in circulation (which is also part of the Fed’s balance sheet). When Yellen came up with the analogy that QT is akin to watching paint dry on a wall - and the market bough it - folks at the Fed must have been thrilled. That is, the Fed doesn’t want QT to disrupt markets. Except now markets are having a fit and it is as yet unresolved exactly how small the Fed balance sheet should be. If I’m not mistaken, the Fed thought they have until late 2019 to worry about when to halt QT. Well, the paint on the wall has dried up and the market wants answers. And the Fed doesn’t have an answer, except that it is wading in a dark room. That may be correct, but isn’t very helpful. Remember, when you walk in a dark room, even when you are careful, you sometimes hit sharp objects. As I alluded to in the beginning, the Fed sets the benchmark for the risk-free asset. However imperfect that may be, it’s better to know what the Fed is up. It’s worse not to know. But it’s truly bad if the Fed is wavering based on the whims of the markets. After Powell flip flopped to suggest the Fed could also be easing, equity markets surged. Does that now mean all is dandy and the Fed can resume tightening? To put it gently, Powell is learning on the job. Based on CFTC data, speculators had been betting aggressively on higher rates through the third quarter of 2018. In many ways, the change in rate expectations may well be a result of a short squeeze (betting on higher rates requires shorting certain instruments) that then took on a life on its own. Meaning: just because the markets are moving doesn’t always mean fundamentals are changing. There’s a reason the Fed’s institutional setup is to act slowly. Let’s not forget why the Fed wanted to raise rates in the first place. It is because unemployment is at incredibly low levels while wage pressures are gradually rising. Incidentally Powell has been increasingly shrugging off rising wage pressures, suggesting they imply higher productivity. While it is correct productivity has been rising, ignoring higher wages is, in my view, irresponsible, as it risks dislodging the market’s tame inflation expectations. As you might imagine, my conclusion is that, at the very least, volatility is to remain elevated for all the reasons mentioned above, exacerbated by the Fed’s lack of clear direction. I agree with most observers that the economic cycle is nearing its end. I disagree, though, that we are at a cliff about to crash. More importantly, given the tight labor market, I believe inflationary pressures will continue to rise, ultimately limiting the Fed’s maneuvering room. As alluded to above, it is perfectly compatible in my view that corporate America is suffering, but that the economy won’t fall into recession – at least not yet. As we are approaching the end of the economic expansion, will king dollar be de-throned? In favor of a weaker dollar is an expectation of lower rates ahead, especially given the run up in recent years. That said, as indicated earlier, it is by no means assured we have reached the peak in the U.S. rate hiking cycle. In my judgment, though, even as U.S. rates may be moving higher, investors will increasingly focus on the eventual downturn; added to that may be rising U.S. inflationary pressures that will tame real rates. It’s in this context also that the price of gold has done reasonably well despite rising rates: as gold does not pay a dividend, it competes with any real return available on cash. Late phases of an economic expansion are - in our analysis - often associated with rising inflation (the challenges Powell is faced with are really not new), which may well be another attribute as to why some investors are buying gold. I tend to point out another dimension: diversification. When rates are up, risk assets face headwinds as their future cash flows get discounted more; with volatility up, valuations can be all over the place. In contrast, gold’s lack of cash flow is a benefit in this context as there is no discounting of a cash flow. Clearly, the price of gold has historically been volatile, but our analysis shows it has had positive performance in each equity bear market since 1970, with the notable exception of the early 80s when then Fed Chair Volcker raised real interest rates to very high levels. If my crystal ball is correct, the price of gold may break out further to the upside when we are closer to the end of the rate hiking cycle. As recent history suggests, though, the time to diversify is ahead of the unfolding of actual events. Looking across the ocean, it’s noteworthy that the Swedish Riksbank, one of the central banks with negative rates, recently raised rates. I mention this because the ECB is also mulling a rate hike later this year. Europe clearly doesn’t act in a vacuum- if your view is that the global economy falls off a cliff, but I wouldn’t underestimate the odds of an ECB rate hike, if for no other reason than ECB chief Draghi may want to tie up loose ends before retiring late this year. It is also difficult to imagine someone more dovish to take Draghi’s role, thus possibly causing an adjustment higher in the rate path. All of this doesn’t bode too well for equities. That said, historically, bear markets tend to mostly coincide with recessions. We happen to think we are not there yet. But this doesn’t mean investors shouldn’t be cautious. Most investors have a certain risk tolerance; with volatility elevated and years of a bull market in equities, odds are their portfolios are riskier than they signed up for. That’s why we preached a long time ago already to diversify. The time to diversify is not exactly at the peak of the markets - as that’s extremely difficult to time; instead, in our humble opinion, managing risk consists of stress testing one’s portfolio before the tide turns, then taking initiatives. Nonetheless, we spend considerable time seeking to identify the peak in the business cycle (please see our research reports at merkinvestments.com/research). 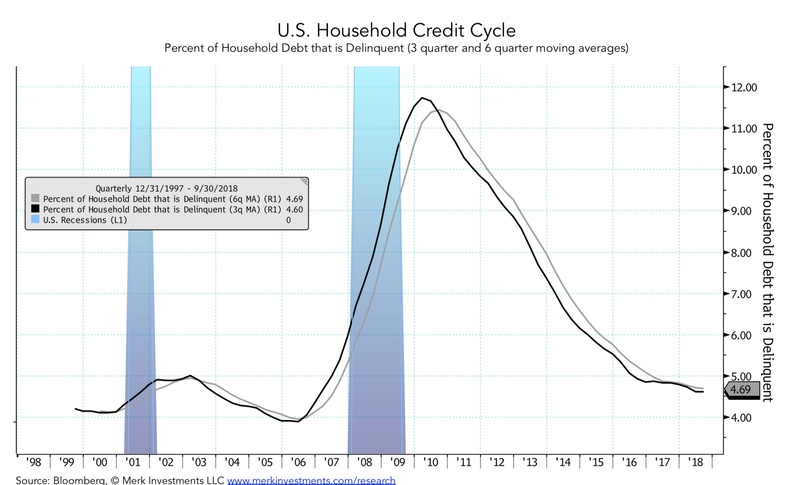 Not only is the peak in the business cycle an important reference point, there may also be an opportunity to take advantage of what then may be interest rate cuts, as - historically speaking – future rate cuts are not fully priced in at that stage. You may reach out to us to learn more about how we might be of service to help structure a portfolio to navigate these financial waters. Please sign up for our free Merk Insights, explore our chartbooks and follow me on LinkedIn, Twitter, Facebook or Patreon.